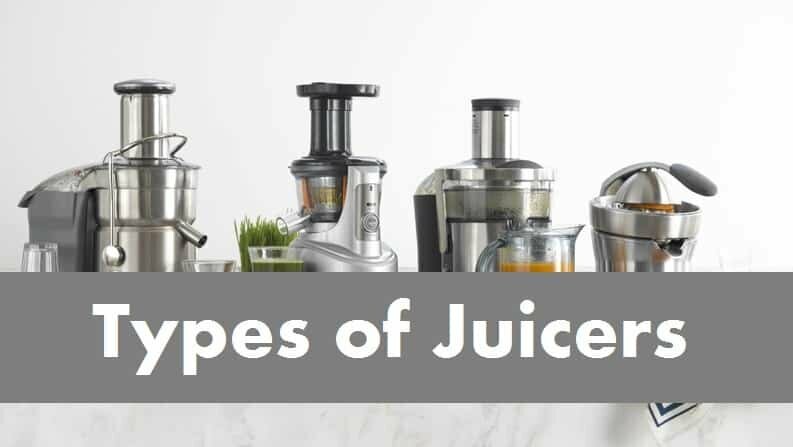 What Types Are Juicers Are There? There are a number of different juicers available in today’s market, each suited to a particular juice style and type. If you are in the market to buy a juicer, be sure to read our juicer reviews here and select the best juicer for your need. The first type of juicer is a manual juicer. In this instance no electricity is required, the juice is squeezed out of the ingredients usually as a result of the user turning a handle to initiate a contraction and release mechanism. The juice yield is relatively low, and the juicers are limited in what ingredients can be successfully used. However the clean up required is minimum and the basic apparatus is cheap in comparison to the other juicer types. In terms of electrical juicers, a centrifugal juice extractor is what would be defined as the ‘traditional’ juicer. In this process, a metal blade rotates rapidly against a mesh filter and using centrifugal force separates the pulp and the juice, which are collected in separate compartments of the juicer. Although centrifugal juice extractors are relatively cheap in comparison to the newer juicer models, they generate a lot of heat during the juicing process which can potentially either break down or oxidise enzymes in fruit and vegetables used in juicing, devaluing their healthy potential. Masticating juicers work quite differently, they operate using a single gear to chew up the juicer ingredients. This releases the juice but also compacts the pulp and so proves very simple to remove waste. The downside to these juicers is they are much slower than centrifugal juicer and so take longer. However they create next to no heat and so there is no risk to them damaging the cellular structure of the enzymes present in the juice ingredients. Additionally, the juice product is said to be neither warm nor frothy, two complaints often observed with the centrifugal juicers. The fourth and final style of juicer available on today’s market is the triturating juicer. In juice creation two inwardly rotating gears interlock crushing anything that is found between them. The benefits of this juicer are very similar to a masticating juicer. But it can be said that due to its structure the triturating juicer produces an even higher yield and is even more effective in the juicing of harder ingredients such as nuts. It’s greatest disadvantage is its high cost. The below, while a little dated, will hep clear things out.